That breakthrough, and the president’s attendance at the Summit of the Americas, will help to build momentum for normalized relations. Thirty-three years after this flagrant effort to obfuscate the difference between supporting revolution and sponsoring international terrorism, President Barack Obama has finally decided to de-list Cuba—creating momentum for positive engagement with Raúl Castro as they both make history by attending at the 7th Summit of the Americas in Panama. This week, the president received a long-awaited State Department "review" recommending that Cuba be taken off the list; at some point in the near future, the president is likely to officially notify Congress that the list will be reduced from four to three nations (Syria, Sudan, and Iran). “Cuba’s removal from the list brings US policy back into accord with reality and clears the way for progress on a whole range of other bilateral issues,” according to American University Professor William LeoGrande, who has published a history of the issue on ForeignAffairs.com. Indeed, extracting Cuba from this gallery of rogue states not only redresses a historical insult and injustice; it removes a key obstacle to restoring official diplomatic relations with the Cuban government—a game-changing goal that the Obama administration hopes to significantly advance at the two-day regional meeting in Panama. Since then, US and Cuban negotiators have met at least three times to iron out the complex issues of establishing fully functional embassies in Havana and Washington. The Cuban negotiating team, led by foreign ministry official Josefina Vidal, made its position clear: removing Cuba from the terrorist list, and lifting the onerous financial sanctions that go with it, was necessary for normalizing diplomatic relations. The United States team, led by Assistant Secretary of State Roberta Jacobsen, reportedly sought to use the list as bargaining leverage to obtain concessions on other components of the agreement, including freedom of travel on the island for US embassy officials and free access to the embassy for Cuban citizens. Behind-the-scenes negotiations also took place over a procedural requirement that the president certify to Congress that Cuba has pledged not to commit or support future acts of international terrorism. 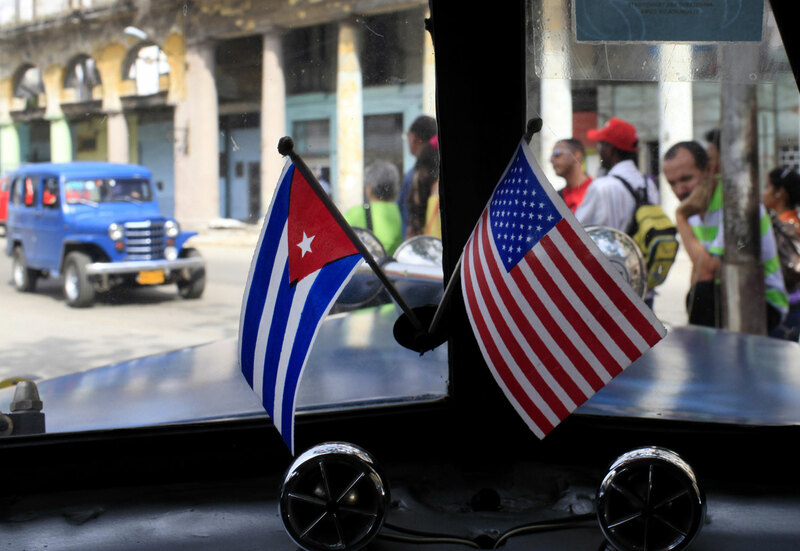 In the spirit of reciprocity, Cuba has sought the same pledge from the United States. After all, the historical record of violence directed at Cuban targets is replete with CIA and exile-sponsored assassination attempts, sabotage and bombings—among them the October 1976 attack on a Cuban jetliner that killed all 73 men, women, and children aboard, and a more recent plot in November 2000 to kill Fidel Castro by blowing up an auditorium in Panama where he was due to speak. While key Cuban-American legislators accuse Cuba of harboring violent fugitives from the United States, from the Cuban perspective it is the United States that is currently providing safe haven for terrorists such as Luis Posada Carriles, whom both CIA and FBI intelligence reports identified as the mastermind of the plane bombing, and who spent four years in a Panamanian prison for planning the November 2000 assassination attempt. Once those issues have been resolved, the last roadblock will be the US Congress. When Obama sends his notification to Congress to remove Cuba from the list, a 45-day countdown begins, during which the Senate and House will debate this issue. Already, a handful of hardliners, led by Senator Robert Menendez, are accusing Obama of being “misguided” because Cuba continues to provide political asylum to former black militant “cop killers” such as Assata Shakur (formerly JoAnne Chesimard). The president’s decision to de-list Cuba will become the first political test in the Republican-led Congress of support for, and opposition to, Obama’s historic efforts to write a new chapter in US-Cuban relations. For now, however, all eyes are on Panama, where, for the first time in more than half a century, a US and Cuban president will take a seat in the same conference room along with the other leaders of Latin America. As the last Summit of the Americas that Obama will attend gets under way, the president has moved to fulfill a policy promise that he made at the first summit he attended six years ago. “The United States seeks a new beginning with Cuba,” he told a skeptical audience in 2009. “I know there’s a longer journey that must be traveled to overcome decades of mistrust, but there are critical steps we can take toward a new day.” Removing Cuba from the terrorism list is a critical, if long overdue, step in the right direction. Peter KornbluhTwitterPeter Kornbluh directs the Cuba Documentation Project and the Chile Documentation Project at the National Security Archive in Washington, DC, and is co-author, with William M. LeoGrande, of Back Channel to Cuba: The Hidden History of Negotiations Between Washington and Havana. Kornbluh is also the author of The Pinochet File: A Declassified Dossier on Atrocity and Accountability.